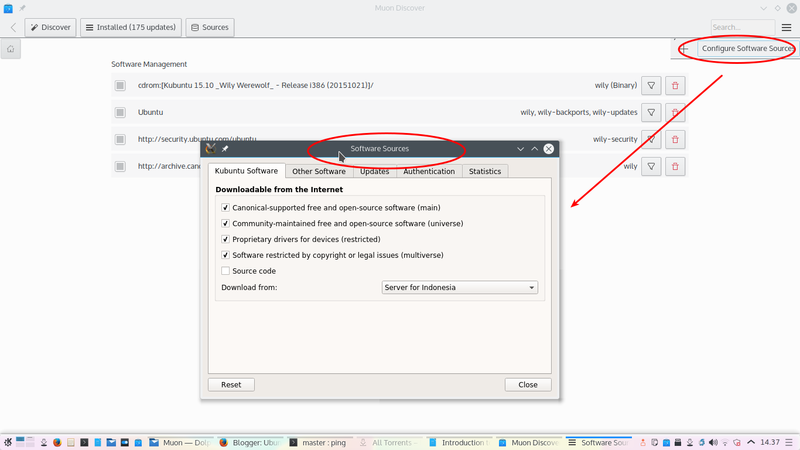 In Ubuntu regular version, we use Ubuntu Software Center (USC for short) to install applications. In Kubuntu (Ubuntu KDE version), we use Muon Discover (Muon for short). USC and Muon are two same functional things, but with different details. 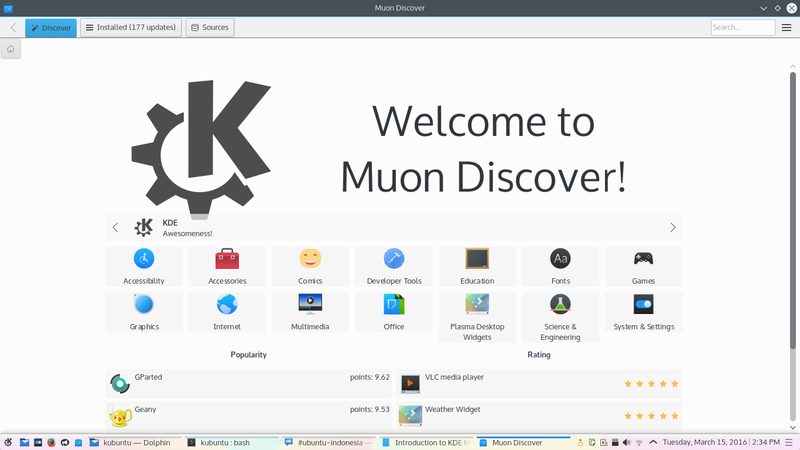 While USC created specially for Ubuntu, Muon created for any Debian-based distribution using KDE, thus Kubuntu uses Muon. For those don't know, Muon Discover as desktop application is similar with Google Play Store as mobile application in Android, or App Store in iOS, or Mac App Store in OS X. 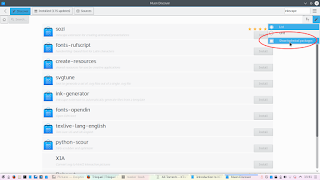 Here, we explain how to use Muon as Kubuntu Software Center. Before using Muon Discover (Muon), you must do a “Reload” first by performing a command below. This command will download index files from the repository server (so further you can search for any application without internet). If you don't do “Reload”, Muon won't find many apps because it has no index yet. Type in search bar any program you want. For example, I enter my favorite program name geany. 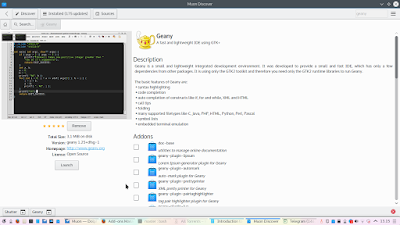 Muon shows some results and one of them is Geany, a lightweight IDE. 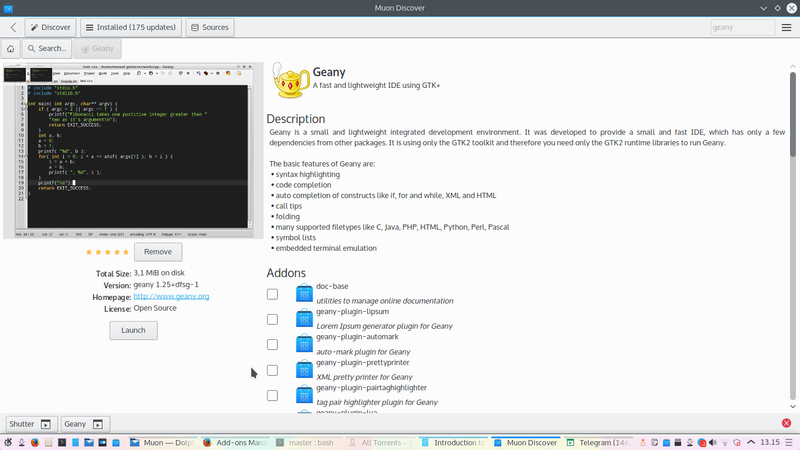 By clicking the Geany entry, Muon shows a new page contains detailed information about Geany application including its picture (screenshot) and suggests some another programs. This picture viewing needs internet connection, though. To install an application, search first and then press Install button. You will be asked for password in a new dialog window. 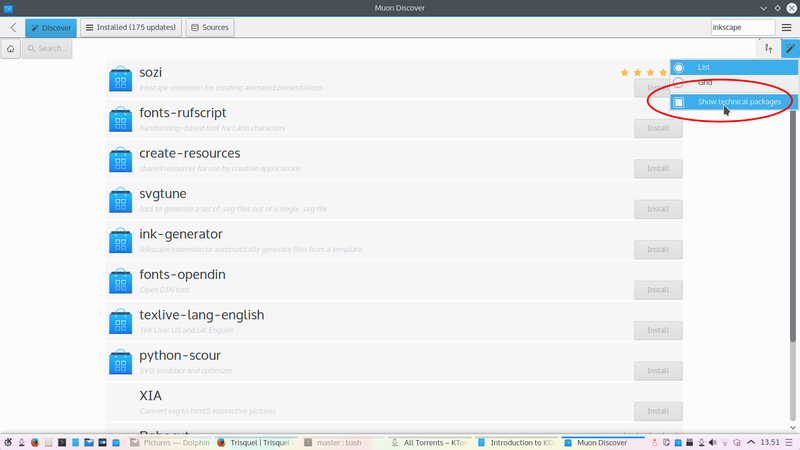 Then Muon shows installation progress indicator on the bottom bar as a tab with application name. Wait until Muon finishes the progress (downloading and installing). I suggest you to pause another download (torrent, browser, etc.) while Muon is downloading. Once finished, you will see Remove button appears in the application Entry and of course you can run the installed application. To uninstall an application, search and then press Remove button. This will delete selected application from the system. Removal progress doesn't need any internet connection. 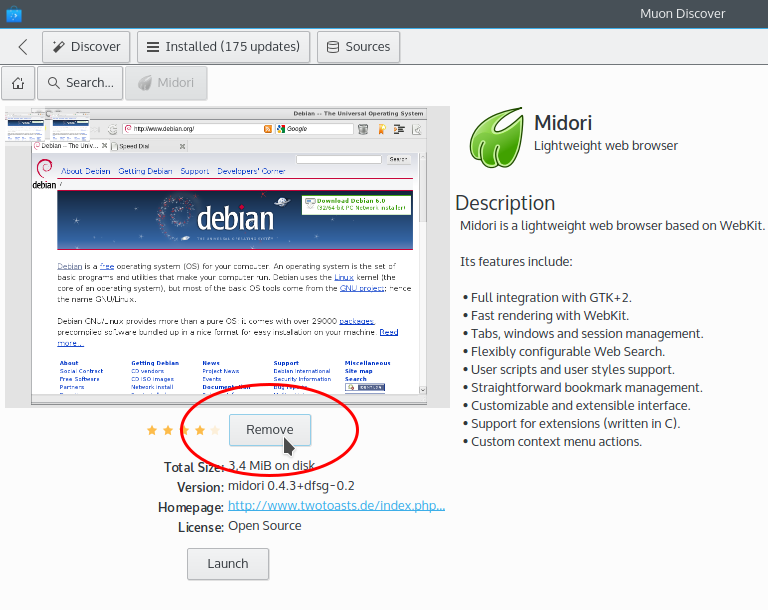 While finished, Muon shows Install button again for the application entry. 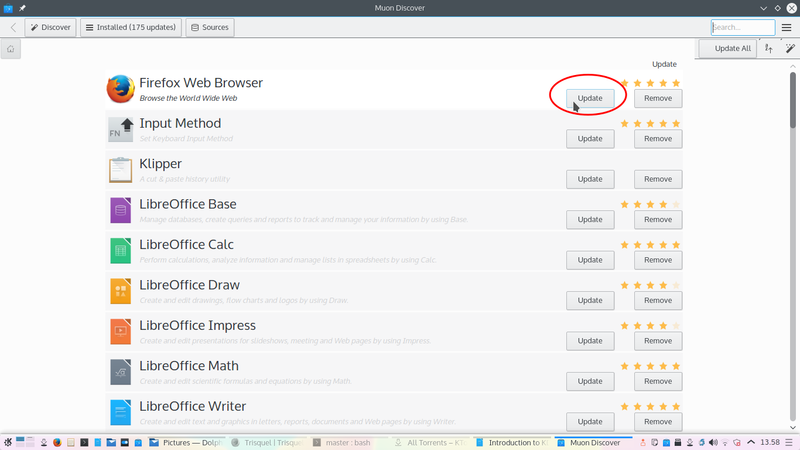 To upgrade an application, press Installed button on the top panel. You will see some or many applications with Update button on the right side. You may choose application you want to upgrade, not to upgrade a whole system. This allows users with limited internet bandwidth to upgrade carefully. You may see hidden package entries by clicking magic wand button on the top-right panel > select Show Technical Packages. This hidden packages is actually normal packages just link your applications, but by default Muon hides them, and shows you only “application packages” (the packages that recognized by users as applications). The most important part of technical practices with Muon (or any other package manager) is configuring the repository. 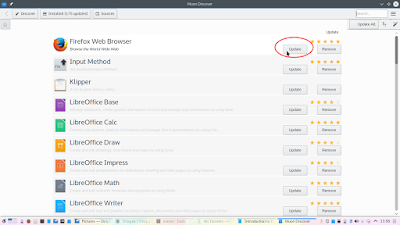 In Muon, you can click menu button > Advanced > Configure Software Sources. 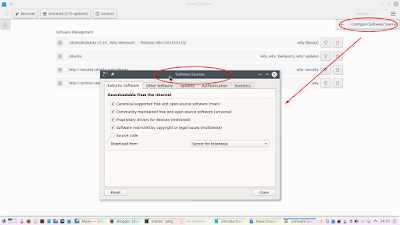 This will open Software Sources window (program name: software-properties-kde). Here, you can choose what repository to enable/disable, when to automatically upgrade (or simple disable it), and adding new repository (or delete repository).